Lola’s songs worked great. I played them in the grooming stall before lessons. I played them at the stalls before the show. I even sang parts of them to her. “I met her in bar down in old Soho …” kept us at a walk more than once. “Her name was Lola …” would get us started trotting. By the time I got to “… yellow feathers in her hair …” we would be sorted out. Now, I’m compiling a second motivational mix tape/playlist for general use and for horses who don’t have their own songs. 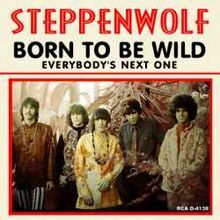 “Born to be Wild” by Steppenwolf is an obvious choice. I’m looking for others. Please note, I have the music ability of a pat of butter, so the beat must be unmistakable. Lyrics will stick in my mind better than orchestral music. With the exception of, say, the 1812 Overture. Even I can remember that tune. Love ‘Born to be Wild!’ Can’t think of anything off the top (or any other part) of my head right now, but will think on it. For upbeat trot tempo, Runaround Sue works well. Del Shannon’s Runaway may not set the right tone, but it’s a good trot song too. To soothe and settle, Stairway to Heaven, any of the old Elvis ballads, especially Fools Rush In. Moon River is good settling song, and Love Potion #9 is great trot song too. From The Last of the Mohicans soundtrack: “The Kiss”. I remember my daughter once doing some kind of reining pattern to it. Sorry, no lyrics. Just beautiful and inspiring. Bad, Bad Leroy Brown (Jim Croce), Lay Down Sally (Eric Clapton) Windy (The Association), Happy Together (The Turtles. Probably one of my favorites!) Love Me Do (Beatles. Really simple lyrics.) Mrs. Robinson (Simon & Garfunkel) Good Vibrations (The Beach Boys) Dancing In The Dark (Bruce Springsteen) Do a Youtube search. Many songs have the lyrics and the tune online. OK, gotta stop now. Too many songs stuck in my head! Lemon Tree is another good trot song. Time in a Bottle (Croce) and House of the Rising Sun (now there is a contrast!) are good for steady canter rhythms.